There are many types of headaches, however the two most common kinds include tension and migraine. Tension: Tension headaches typically cervicogenic (meaning coming from the neck) and can give the feeling of a tight band of pressure around the head itself. It is typically caused by either physical or emotional stress. 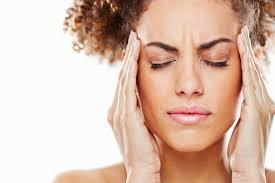 Migraine: Migraine headaches are often described as severe pulsing or throbbing like pain. They can also cause nausea or visual disturbances such as sensitivity to light. They can also be caused by physical and emotional stress however they can be influenced by consuming certain foods, hormonal fluctuations, decreased sleep, low water intake or a lack of nutrients. In most cases of headaches or migraines the neck is involved. By involved, I mean, there can be restriction or abnormal motion in the facet (small) joints of the spine with the presence of associated muscle trigger points or tenderness. Addressing these issues, as well as those that include nutrition or water intake is extremely important in fixing the problem. A comprehensive chiropractic approach in our office may include several of the following treatments depending on what we identify as the source and contributors of the problem. 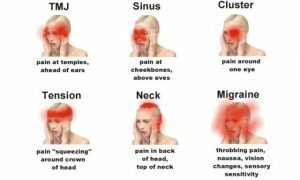 Chiropractic adjustments or manipulation aim to improve joint motion or correct joint dysfunction allowing for decreased inflammation of joints and tension in muscles which contribute to chronic headache or migraine pain. Active Release Technique (ART) applied to the involved musculature to relieve unwanted tension and return muscles to resting length. Rehab exercises are given in an effort to help improve biomechanics and reduce postural stress and strain that may be contributing or causing a chronic problem. This will provide support and stability to the area of complaint thereby reducing reoccurrences. Dry Needling can be performed in an effort to break up deep muscle trigger points that lie below the more superficial muscles and are difficult to reach with manual pressure. Signs that may point to deep trigger points would be getting some temporary relief only to experience a return in symptoms within a few days. Cupping is another form of soft tissue therapy which allows for purposes of pain, inflammation, circulation, and relaxation of the affected areas. Postural assessment allows us to identify areas of the body that undergo repetitive stress and can cause continuous neck strain leading to headaches. Nutritional advice regarding certain foods/drinks to consume/avoid which may have an affect on persistent headaches. If you have questions about your headaches or about our comprehensive chiropractic treatment please call one of our offices. 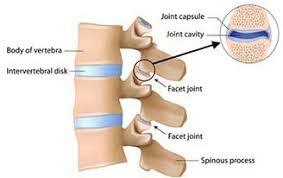 Rohlfs Chiropractic Care is your local chiropractor in Wilmington, Ohio, Sharonville, Ohio or Anderson, Ohio.